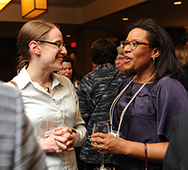 The Office of Alumnae Relations produces events and programs that connect alumnae to Smith and to one another. Programs tackle intellectually challenging and timely topics addressing the needs and interests of alumnae while showcasing initiatives of the college. Programs range from Reunion to regional professional gatherings to webinars and conferences.